My fridge hasn’t been to inspirational recently. But after a traumatic 5km charity run I thought I’d treat myself with a nice supper lastnight. So when I got back from work today the standard of fridge leftovers was a lot better than usual. 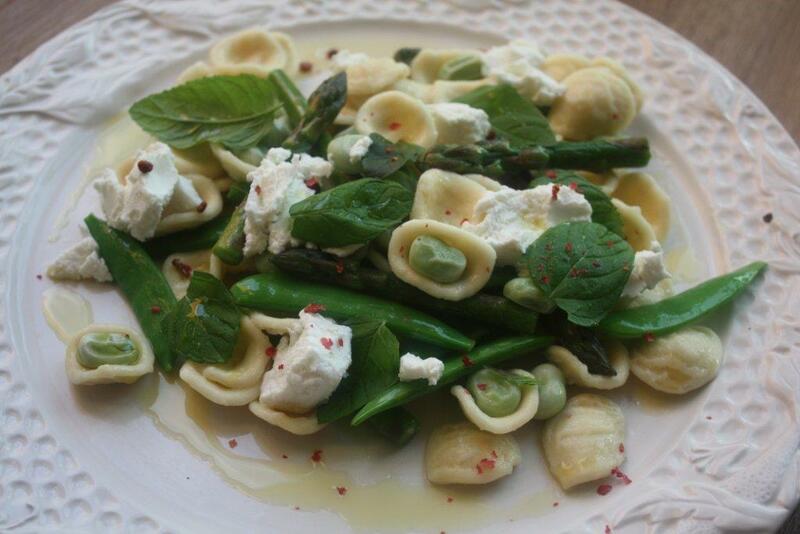 Some asparagus, sugar snaps and soft goat’s cheese. Delicious. I ferreted out some frozen broad beans, mint leaves, virgin olive oil and some crushed pink pepper. And then the best bulking out ingredient ever: orecchiette. I’m not one for splashing the cash in the supermarket unless it’s for a good reason. But if you’re using nice ingredients, it really is worth the extra £1 for this ‘little ear’ Southern Italian pasta made from durum wheat semolina and water. They have a slightly rough outer surface, and a tasty soft, chewy centre. It’s a light meal with great summery flavours. And it’s a classic one pan dish – the pasta takes ten minutes, so chuck in the broad beans six minutes into cooking, and then chuck in the asparagus and sugar snaps a couple of minutes later. Drain and dress with mint leaves and goat’s cheese. I’m not the biggest fan of cheesecake, so I won’t be waxing lyrical about this recipe. As cheesecakes go though, it’s a real good’un. The addition of mint and balsamic stop it from being one-dimensional creaminess, and turn it into something a bit more sophisticated and interesting. It’s a Fiona Cairns (of royal wedding cake-maker fame) concoction from her Bake & Decorate cookbook. If you’ve got some end-of-season strawberries, then this would be a great way of using them up—especially if you’re throwing a party for pudding lovers over the weekend, and you’re looking for a centre piece to finish the meal with. Preheat the oven to 170C. Butter very well the base and sides of a 23cm diameter, 7.5cm deep, round springform tin, making sure the flat side of the springform base is uppermost (the lipped side makes it hard to remove the cheesecake). Put the biscuits in a polythene bag, seal, then bash with a rolling pin until very fine. Tip into a bowl and mix in the butter and mint. Lightly press into the tin with a spoon. Bake for 15 minutes, then leave to cool. 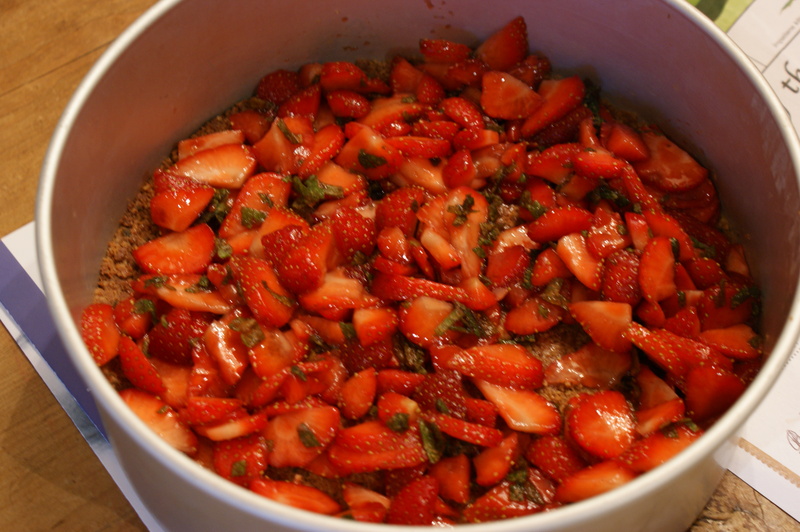 For the strawberry filling, simply mix everything together in a bowl and leave for 1-2 hours for the strawberries to absorb the flavours. Drain the strawberries, reserving all the delicious juices. For the cream cheese filling, place 3 tbsp cold water into a small, wide-bottomed heatproof bowl and sprinkle over the gelatine. Every single crystal must be wet, or it will turn to lumps later on. Set the bowl over a pan of hot (not boiling) water until every crystal has melted. Don’t let it get too hot or it won’t set properly. In a small bowl, beat the cream cheese until smooth. In another bowl, lightly whip the cream and vanilla. 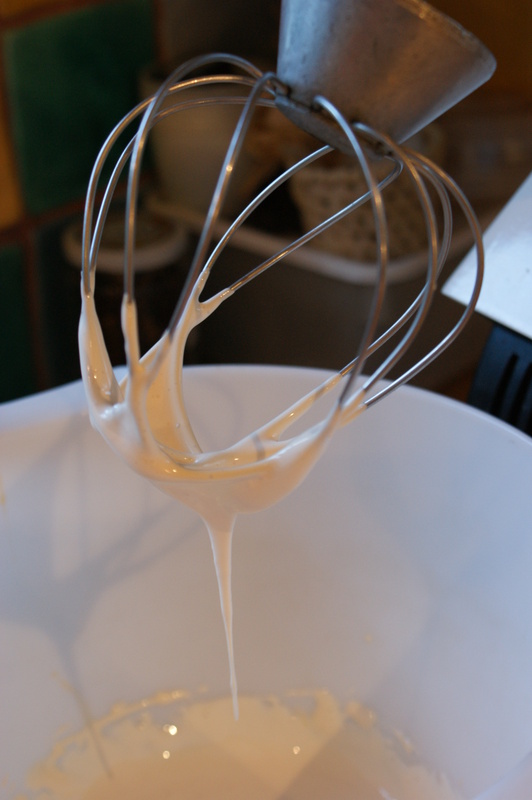 Using an electric mixer (or handheld whisk), whisk the egg yolks and sugar until thick, pale and doubled in volume. Carefully fold in the cream cheese, then the cream. Take the strawberry juices and mix them into the gelatine liquid, sieve out any lumps, then fold in a spoonful of the cream mixture. Once well blended, gently fold in the remaining cream. 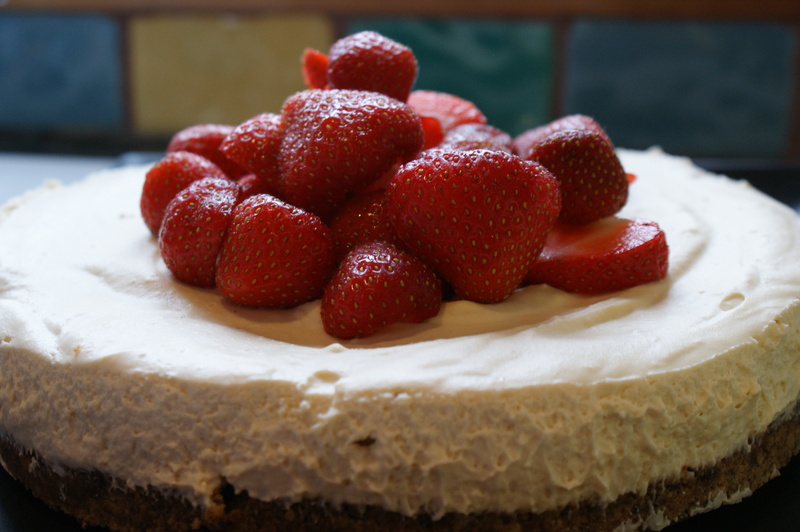 Spread the marinated strawberries over the centre of the biscuit base, ensuring they do not reach the edges. 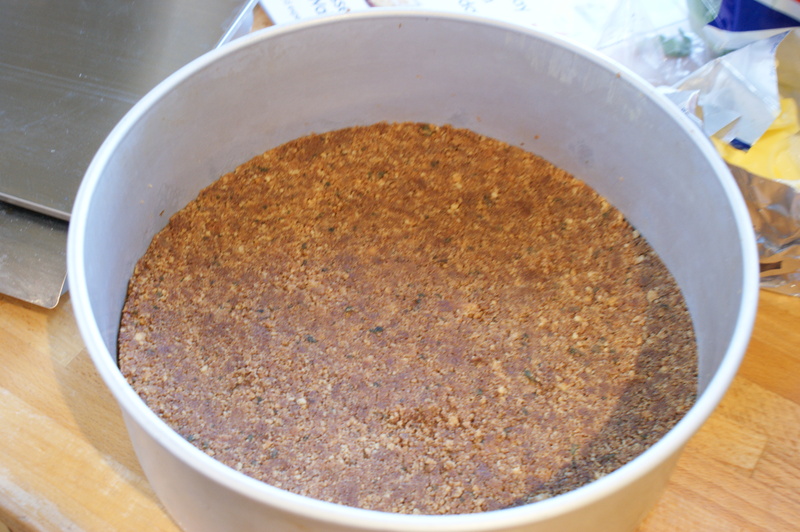 Spoon on the cream, level the surface and place in the refrigerator overnight to set. When you are ready to serve, dip a knife into hot water, release the spring and run the knife around the edge of the tin. Ease off the base with a warm palette knife and transfer to a serving dish. 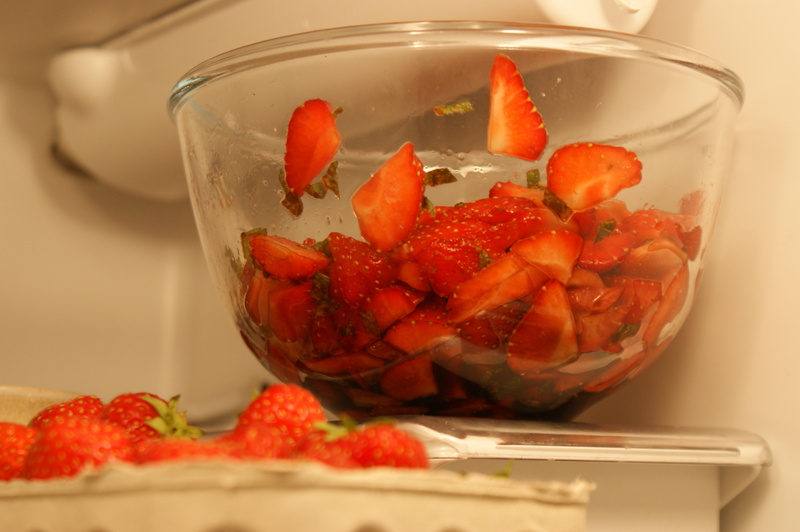 Finally, decorate with the sliced strawberries and mint sprigs.